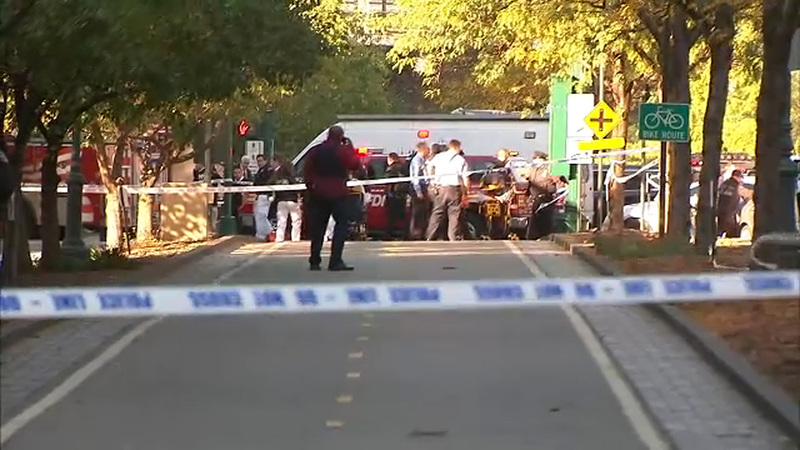 LOWER MANHATTAN, New York (WABC) -- Witnesses are describing the terrifying moments as a deadly incident being investigated as terrorism unfolded on the West Side Highway Tuesday afternoon. At least eight fatalities and around a dozen injuries were reported when police say the driver of a white pickup truck drove onto the bike path and ran over several people before crashing into several other vehicles. The sprawling crime scene runs several blocks, and a suspect who may have been shot by police is in custody. A witness named Eugene spoke with Eyewitness News by phone, describing the horrifying scene he saw after leaving work at Pier 26. "I heard something behind me, and when I turned, I saw a truck, a pickup truck, a white pickup truck, and he ran over two guys, and unfortunately, I went up to the bodies, and they had passed away," he said. "He kept going down on the bike path on West Street, down by the park. And then he hit a few cars, and then when I heard the cars get hit, I looked that way, and I heard gunshots. And then everybody started running." Eugene said the driver then crashed into a yellow school bus. Ramon Cruz was in the area at the time, and he said the driver did not appear to be bleeding when he exited the vehicle but was walking with a noticeable limp and was screaming. Tim Fleischer interviews an eyewitness of West Side bike path incident.